Hydrodynamic stability is of fundamental importance in fluid mechanics and is concerned with the problem of transition from laminar to turbulent flow. Drazin and Reid emphasise throughout the ideas involved, the physical mechanisms, the methods used, and the results obtained, and, wherever possible, relate the theory to both experimental and numerical results. A distinctive feature of the book is the large number of problems it contains. These problems not only provide exercises for students but also provide many additional results in a concise form. This new edition of this celebrated introduction differs principally by the inclusion of detailed solutions for those exercises, and by the addition of a Foreword by Professor J. W. Miles. Foreword; Preface; 1. Introduction; 2. Thermal instability; 3. Centrifugal instability; 4. Parallel shear flows; 5. Uniform asymptotic approximations; 6. 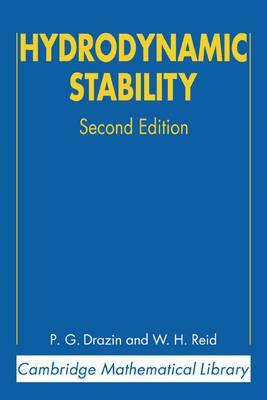 Additional topics in linear stability theory; 7. Nonlinear stability; Appendix A. A class of generalized Airy functions; Appendix B. Solutions to the problems; Bibliography; Motion picture index; Subject index.